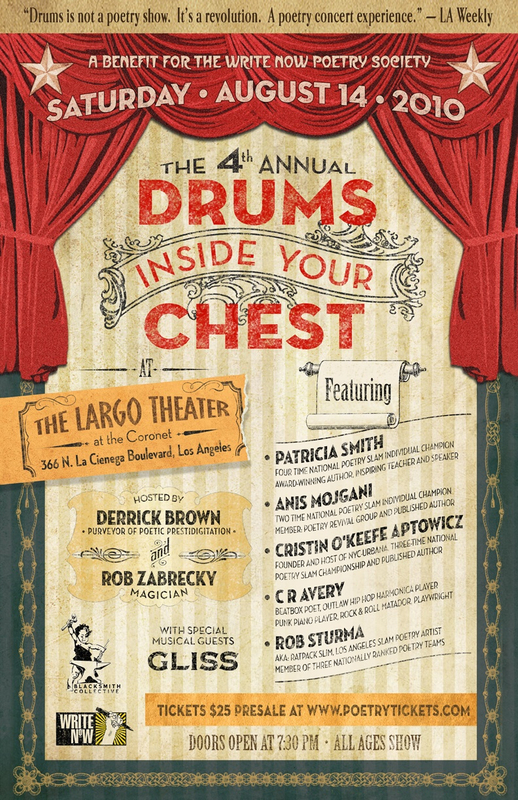 For those of you who still think of poetry as the bastion of beatniks in berets intoning mind-numbing rants to finger-snapping aficionados, The 4th Annual Drums Inside Your Chest will change your mind forever. The poems voiced by the featured wordsmiths are vigorous, dynamic, exciting, funny, and as vital as the blood pumping through your veins. In other words, you need to see this show. It’s not just the featured poets who dazzle. Co-host Brown has toured and performed with Cold War Kids and Decemberists and appeared on Jay Leno; his work has been featured in books with Jeff Tweedy of Wilco, Jeff Buckley, Jack Hirschman, Amber Tamblyn, and poet laureate Ted Kooser. Expect co-host/magician Zabrecky, a Magic Castle and Possum Dixon favorite, to bring further off-balance edge to the show with his eerily unsettling magic while special musical guests GLISS bring “gorgeous shoegaze rawness” to the house. Bottom line, Go Go’ers, you will leave this one-night-only show ready to leap tall buildings in a single bound. It’s understandable if you can’t wait ’til Saturday’s sure-to-be-sold-out show. (Ahem. That means order tix NOW, Go Go’ers.) Luckily, you can sample the excitement sooner via director Stephen Latty‘s intimately compelling documentary of the 2007 show that started it all. Check out clips of Latty’s fest fave Drums Inside Your Chest on YouTube and on the event website; just be prepared to get even more feverish about Saturday night. Poets and patrons…let the wild rumpus start.